The Blunt SS has been specifically designed to be best-in-class for cross country use and can be found at the top of race podiums and also on your pal's bike commuting to the trail. Light enough to win, tough enough to last. 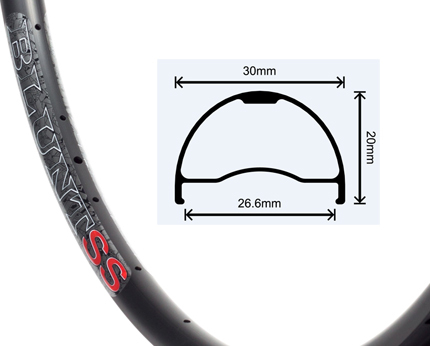 Shorter and thicker sidewalls for incredible durability even when paired with low pressure, tubeless tyres. I-beam bead hook maximizes internal width for optimum tyre performance. Cerchio MTB Velocity Rims Blunt SS valutazione 3.0 di 5 di 1. La tensione massima &egrave; tra 110 e 130kgf.